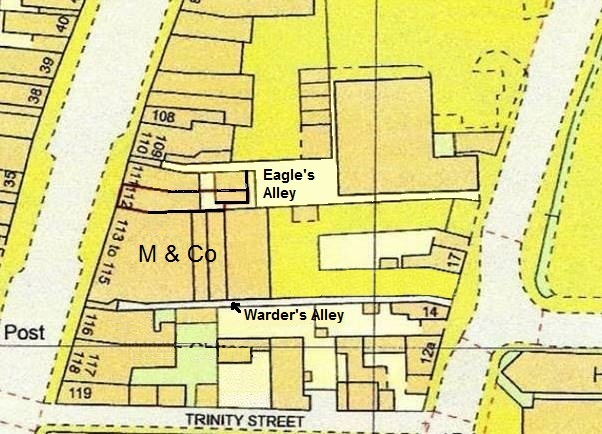 Warder’s Alley is one of Tewkesbury’s most used alleys, but one of the saddest. 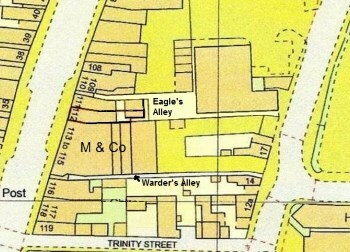 The entrance of the alley was destroyed when the High St frontage was pulled down to make way for a new Post Office. The alley was replaced by a brutal concrete tunnel through the Post Office building, now M& Co. On Oldbury Road, the streetscape was sacrificed to ‘in’ and ‘out’ drives to the sorting office, on either side of a retained and rather stranded house. Richard Warder was a cordwainer (shoe maker) who lived in the demolished front house in the early nineteenth century. John Rogers remembers the alley from that period; ‘It is a very old alley and contains some old cottages, very small, like holes in the wall; very dark and gloomy and built mostly of timber and lath and plaster in the old Tewkesbury style’. An intriguing picture of times long gone. 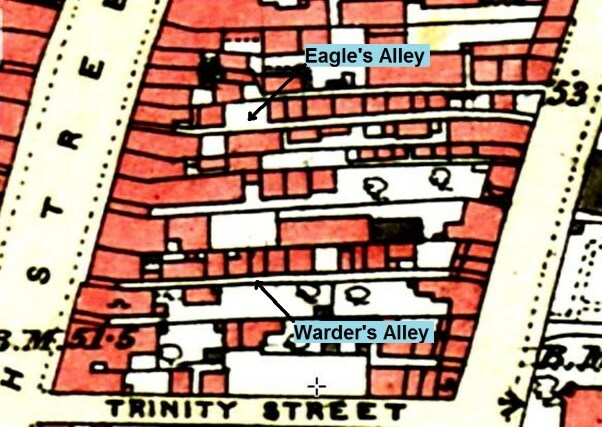 There is little written about Warder’s Alley, despite its age, because only life on the main streets is recorded, except for the occasional sale of properties. Nothing dramatic happened. In 1855, two ‘neat brick-built’ cottages, occupied by James Bray and Thomas Deveraux were sold by auction. There were problems reported by the health board and instructions given to resolve them. Mr White, who lived in Gloucester owned two cottages which he was instructed to repair because they were in a dangerous condition. He needed reminding, and threatening with ‘proceedings’. In 1885, a case of overcrowding was reported, where Richard Forth’s large family were crowded into a cottage with just one bedroom. No help was offered, just an order to do something about it. The problem was resolved, presumably with the help of friends and relatives. There were tragedies; Mr and Mrs Avery’s nine week old daughter died in the night, unexpectedly, of unknown causes. Compared with others, Warder’s Alley was quiet and well-behaved. There were occasional reports of illegal gambling, but little else to upset the equilibrium until 1922, when William Wilkins took to making regular drunken assaults on his wife. There was no wholesale demolition. The co-op pulled some down to build a warehouse in 1914; a clearance order for others was made in 1938. In 1940, they were almost reprieved because of the acute housing shortage, but were the only properties not considered suitable for repair and occupation. Demolition went ahead, though there were still some cottages occupied in the late nineteen-forties. The alley died slowly, but with the Post Office arrival it died almost completely. Project Alleycat wants to bring some interest back to Warder’s Alley. We have had talks with County Highways about installing alley lighting (there isn’t any) and improvements to the pavement. More immediately we have a couple of surprises which we hope will bring a bit of joy to alley users.